SCORE has accepted a protest from #21 Gustavo Vildosola, Jr. against #97 BJ Baldwin for failure to stop at Checkpoint 7. A video does in fact indicate that #97 failed to stop at the checkpoint. This video also indicates that #21 failed to stop at the checkpoint. A different video taken at the checkpoint indicates that a Motorcycle and a third Trophy Truck also failed to stop, and four other Trophy Trucks made hard sliding sudden stops. The first twelve motorcycles and the first two Trophy Trucks came through the checkpoint in darkness between the hours of 12:00AM and 6:00AM. All of the eight 2012 SCORE Baja 1000 Stop Checkpoints were instructed to place the following large rectangular signage on the race course: CHECKPOINT 1/4 MILE - CHECKPOINT 200 YARDS - CHECKPOINT STOP. If the checkpoint crews did not have all of the required signage prior to their departure for the race, SCORE would make arrangements to provide the signs. To supplement this signage, the checkpoints were also instructed to hold a long or short reach stop sign and wave flags, preferably on opposite sides of the designated stopping point. SCORE has determined that due to a serious miscommunication between SCORE and the checkpoint captain, the checkpoint did not have any of the large rectangular signs or a handheld stop sign. The checkpoint captain believed that the signs would be delivered to the checkpoint location, while SCORE was under the impression that the checkpoint captain was in possession of the signs and would have his crew transport them to the checkpoint location. The checkpoint captain was traveling to Baja Sur via commercial airline and was therefore not in a position to transport the signs himself. The checkpoint crew did have two smaller square stop signs, yellow flags and flashlight wands. The flashlight wands were used during darkness and the yellow flags were used after sunrise. The small stop signs were placed on light stands at the designated stopping point. All of the checkpoint workers and their vehicles were located on the driver's left side near one of the light stands. The other light stand was placed across the course approximately 30 feet away from the checkpoint workers and surrounded by a group of spectators. The #97 and #21 were the only Trophy Trucks to come through the checkpoint during darkness, and as mentioned above, both of these vehicles failed to stop at the checkpoint. Even in daylight, a third Trophy Truck which failed to stop seemed to be under the impression that the checkpoint workers were pit flaggers waving him into his pit, so he failed to stop at the checkpoint, but immediately and smoothly turned left into his pit and stopped. This situation was further complicated by the fact that the designated stopping location of the checkpoint was approximately 700 feet before the location indicated on the course gps file. It is also important to note that the checkpoint captain did not file a protest against any of the race vehicles that failed to stop, and did not mention the checkpoint stopping situation to SCORE officials even though he had the opportunity to do so at race headquarters in La Paz. SCORE concludes that the checkpoint was not properly identified or made visible enough for #97 to be held accountable in darkness to the checkpoint stop rule, so the protest is hereby denied and dismissed. SCORE further deems that the time to file a competitor against competitor protest for issues arising from the 45th Tecate SCORE Baja 1000 has expired, so no further protests will be accepted, reviewed or acknowledged. issued penalty for clear, by video recorded, rules violations was applied just the beginning! the lid of Pandoras box a crack did Vildosola racing now pry it full open! o-tone Vildosola Racing Facebook - "Hi everyone, I just got this video from a fan where we can clearly see BJ Baldwin DOES NOT STOP at checkpoint 7 of the Baja 1000. This is an infraction to SCORE'S rule GL11 that states all vehicles are required to come to a complete stop at the stop sign at physical checkpoints. Penalization is disqualification... should we protest??? Cheating is cheating! Rules are rules." So Vildosola Racing is not certain if they should protest and ask their fan-base on what to do! That does not real reflect professionalism one expect from a team with with a Red Bull athlete representing that brand. To me it looks more like media retaliation from that team after intentionally violating a rule with the intent of saving time and gaining a competitive advantage and topping that with a lied about it like a little child caught with his hand in the cookie jar. This indicates at the least missing strength of character that a team-leader or -principal should display. My assessment on the various situations are only based on the only online source I have regarding rules, enforcement and connected penalties and that one is supposedly outdated. However, I cant imagine them rules are taken out without replacement by similar regulations. BJ Baldwin blew the checkpoint barely slowing down, so by equal rule enforcement as demanded by Baldwin - and by obsolete rules which probably similar in new version - this it either 60 minutes penalty or DQ. Tavo Vildosola blew the checkpoint, semi-stopping 50-70 meters PAST the check-point, not at the check-point so equal either 60 minutes penalty or DQ. Blew check-point and continue or blew and stop in distance. Neither entered the check-point at a reasonable and safe speed (GL11). So one rule or another is violated by both. I do not believe SCORE will apply any of the rules and it will boil down - if there is a protest filed and accepted after all - to the catch all rule of "Penalties and/or fines levied at the discretion of the Race Director". So what's the essence of the aftermath from this years Baja 1000? Baja 1000 and the Off-Road Racing sport with SCORE appear in the media - and social media does have influence on opinion building - in a lime light that will shy any future potential corporate race- or series-sponsor away! Statements like "one of the world’s greatest motorsports treasures" are a farce! World greatest motorsports treasure organizing bodies react swift and decisive to clear evidence! This is one of the things that makes them "world greatest". Paris-Dakar (in off-road) or Daytona 500, Indy 500, Monaco GP or 24 hr. of Le Mans are events with similar history yet Baja 1000 is light-years away from being in the same ball-park!! Events as ongoing just increase the speed this race will fade into a insiders-only south-west USA club championship run in Mexico! Do some about it!! Urgent! Racial slurs, America vs Mexico statements, social media bashing, hate speech directed to either race team, drivers or their sponsors, threats of teams and team members for the next race by a large number of people indicate a hooligan style sub-culture in the off-road surrounding which will not only turn of sponsors but local and visiting spectators and reflect badly on the area (Baja) way past the race! 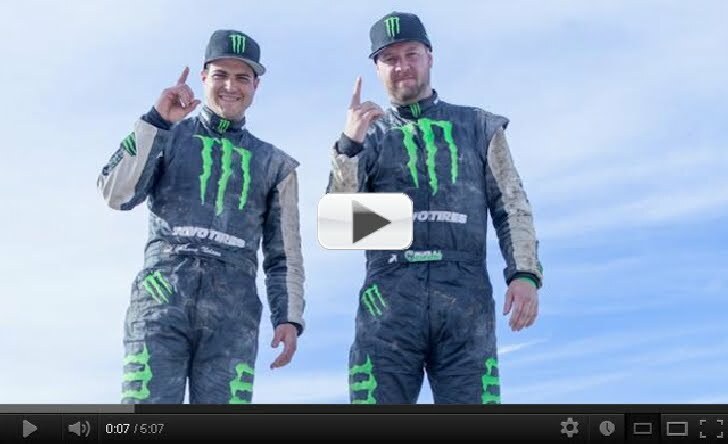 The 2012 Baja 1000 overall 4wheel victory is tarnished! It will be remembered as a 5-ring rules-infraction circus no matter who will be declared winner. Rules will be obeyed much more by the racers as they understand now that if there are xxxxx spectators along the race-course xxxxx minus 200 will have a cell-phone with recording capabilities! Rule violations will reduce significantly. The organizing body learns from situation and may break crusted habits like have a winner ceremony 1 day after the race. Let's a have a finisher celebration based on arrival and give a fair time span to evaluate incoming material as video footage before declaring a winner. In the worst case scenario you have to strip a culprit of his finisher pin if he gets DQ's but the winner will be THE winner of the Baja 1000 and can cherish that achievement with his team and supporters not getting a second- or third-hand trophy. Some folks will understand being a hard-core supporter of a team or individual racer and being objective can get along and racial slurs have no place in any sport. In particular if it's an "endangered species" like off-road racing!! Sorry for my Spanglish and thanks for letting me publish my 2 cents worth here. ~Memin P.
Memin P. is a travel coordinator with a professional incentive and group travel authority and off-road fan. The opinions expressed in this commentary are solely those of Memin P.
Feel free to mail in your opinion and tell us why we should publish it. 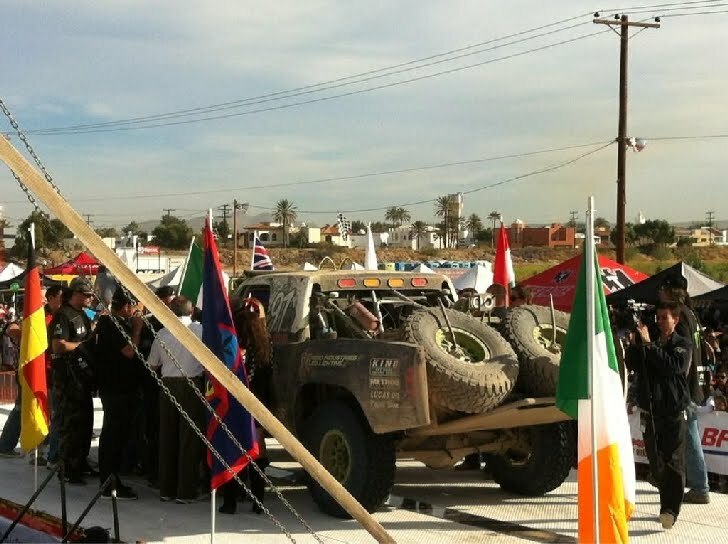 Interview with BJ “Ballistic” Baldwin about his protest of Vildosola illegally pitting on the highway at the 2012 SCORE Baja 1000. This was filmed 4 hours prior to SCORE’s final decision which gave BJ the overall win. The Factory FMF/Bonanza Plumbing/KTM Team earned 2nd overall at the SCORE/Baja 1000 in only their second straight attempt as a Factory Team at the prestigious event. 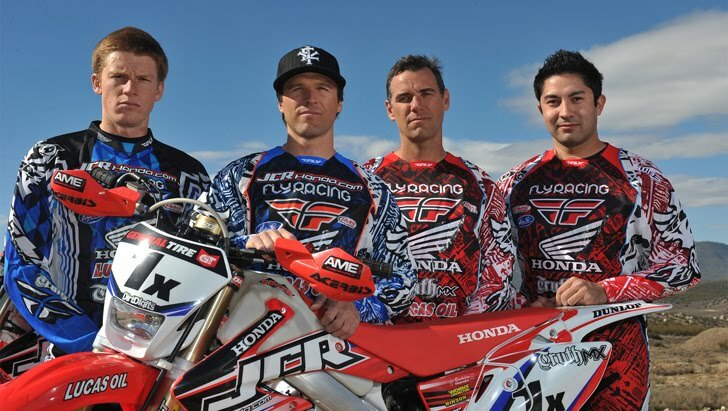 The four rider team of Kurt Caselli, Ivan Ramirez, Mike Brown and Quinn Cody has been training throughout the year in preparation for this event. “We are glad to finish on the podium, but we are all pretty bummed that we couldn’t get closer to battle for the win,” remarked Caselli. It was Mexico native, Ramirez, who started off on the famous 5X bike. He made the transfer to Mike Brown right before the 40 mile marker and Brown took it to mile 265 where Ramirez jumped back on. The KTM team was in 2nd place early on but lost a little time when they ran into a small mechanical problem that was fixed in the first half of the race. Caselli jumped on after the halfway point and was able to gain 5 minutes back to help close the deficit to the lead team. He switched the bike off to Quinn Cody in the night time hours and Cody rode consistent for the next 200 miles. Twelve miles before his check Cody suffered a crash that resulted in a broken femur. While Cody was being transported to the hospital Caselli worked as quickly as he could to get transferred to the scene of the crash in order to get back on the race bike and finish the event. Caselli found the bike approximately 45 minutes after the crash. Despite his best efforts, Caselli was unable to close the large gap that was left after the crash. He eventually crossed the line in 2nd place, a remarkable feat considering the injury of one team rider. Colton Udall, No. 1x, first in class and first overall motorcycle to finish. Colton Udall rode from the start to El Crucero. David Kamo rode from El Crucero to San Ignacio. Udall rode from San Ignacio to Loreto. Timmy Weigand rode from Loreto to the finish. – In San Felipe I passed for the lead and I kept pulling it out and then I gave the bike to David (Kamo.) He pretty much held it or pulled it out more and then we pitted and lost some time. The I think he opened up the lead another three minutes. I got on the bike and lost a bunch of time because I only pre-ran my section three times. We serviced our bike four or five times and changed tires. We had multiple rear wheels that were bald with no knobs. This course just ripped it all up, it was a very tough course. The section through San Felipe was probably one of the gnarliest workouts I ever had in my life. My whole body was locking up. I was just done. It was nice to get to the paved section after that. The race was awesome. The only thing out of the ordinary was that I crashed at about race mile 14. It was super dusty this morning and I made a lot of mistakes. The speed of some of the racers in front of me was just a hair off my pace and they just ruined me. Co-Rider David Kamo said: It helped us out being so far back from the start. That way we can be the hunters. We can see what they are doing and they have to turn around and see where we are. I think that helped us out. It helped Colton push a little bit harder. My stretches went by really fast. There were lots of cows and lots of cars and lots of people. Donkeys, horses, everything. Some were on the trail and some just stood there because we were going by so fast that they didn't move. It couldn't have gone any better. It's a pretty big win for us, this being the 45th Tecate SCORE Baja 1000. Co-Rider Timmy Weigand said: We've been coming to Baja for years and years. We have three amazing teammates and we are the underdogs every race. We weren't the big guys to win and we don't have a star-studded bunch of riders but we've been down here and we have a great mentor in Johnny (Campbell) and a great bike in Honda. We've won this race before so we expected to do the same. Team owner Jonny Campell said: It was a great effort from everyone at JCR. The guys rode hard but smart out there. I never had to get on the bike this time. It was a tough race with strong competition this year. (David) Pearson got close to us when Colton (Udall) was riding. But we were able to pull away. Timmy (Weigand) rode the bike in from Loreto. He is smart and a great finisher. We could feel OX out there with us again this year. His memory is always with us. It is always special to win the 1000. You prepare for everything possible. The overall speed was a little faster than I thought. I thought it would be around 52 miles per hour average, but I think we were close to 55 or so. I don’t think the fog was as bad this year. I think we had a solid rider lineup this year. Everyone seems to get along so well. It was a total team effort. Luke McMillin, No. 103 (First in class and ninth overall four-wheel vehicle. 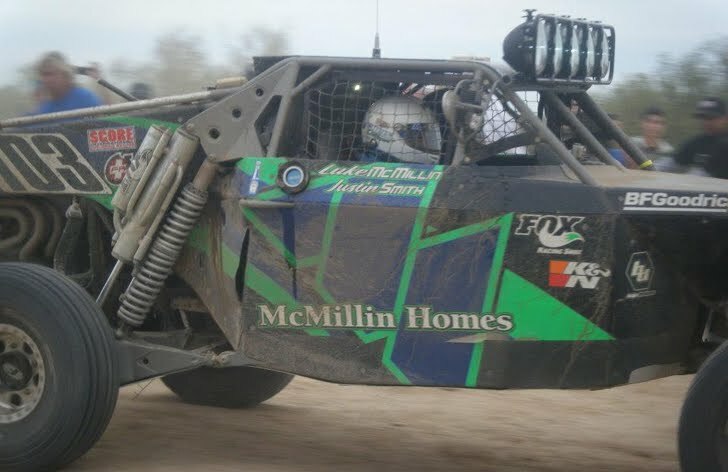 McMillin shared driving duties with Justin Smith.) -- To win the three Tecate SCORE Baja races in my rookie year, I couldn't even dream of that, especially the Tecate SCORE Baja 1000 La Paz run... Unreal, I think I'm dreaming right now. I started the car and went to race mile 350 and we got to San Felipe and we had about a 20-minute lead there. That is where I decided to back it off and go for the class win and not try and chase the trucks. The whups were just nasty. I got it to Justin (Smith) with a 16-minute lead and he brought it back to me with an hour lead. About 100 miles before the finish we had a heartbreaker when the car just shut off. It was the wiring to the fuel pump. We hooked up my Parker pumper to the fuel pumps and got going again. I thought we were done right there. Ronny Wilson, No. 102 (Second in class. Wilson shared driving duties with John Herder and Randy Wilson.) -- We rolled over at race mile 107 and we lost all of the lights and tore the right side and front arms off the car. We were down a little over an hour and after that everything worked okay. We were trying to pass a SCORE Trophy Truck and we moved to the right a little bit and hung a wheel in a ditch and flipped the car over. Clyde Stacy, No. 106 (Third in class. Justin Davis drove start to mile 550. Justin Matney drove to the finish.) – Co-Driver Justin Matney said: We had some belt issues and lost a rear rotor. We got stuck with Herbst at race mile 595. We came around a corner and we slid into him. We helped pull him out. We worked together to get our car out and then we helped pull him out. We lost about an hour. That really killed us when we got stuck. Jon Walker, No. 107 (Fourth in class. Walker drove the entire race) -- We rolled it at race mile 100 and I walked about two miles. We missed a turn and I decided instead of backing up, to take a motorcycle line. We got stuck in the tide. It was the complete Baja experience. There was some wicked silt. Nils Castillo, No. 145 (Fifth in class. Castillo shared driving duties with Nils Castillo and Joe Custer) -- Co-Driver Joe Custer said: The tires were awesome. We had one flat but other than that the course was fast. It's the first time in our buggy. It was fabulous. Gene Haas did great, he put the car out front. We had a rear start and we were running fourth when he got out. We are going to have a nice off-season now. The last two years we broke. A new truck and it didn't break so we had a good run. Tony Miglini, No. 105 (Sixth in class.) -- About four hours into it I got super tired. We had brake issues and we stopped and then we capped off our right rear caliper and decided to run with fronts and one rear. Before, we only had fronts. We were in a killer spot earlier in the race for a long time. We relinquished first during the first stint with Armin Kremer. Andy’s whole job was just to be cool and take it easy. He did everything he was supposed to. He brought the car in, in one piece. I think we were seven or eight spots back and then when the sun came up it was game on. Once I stopped being tired it was killer. We were flying. It's a big thing for my first year in Class 1. Travis Chase, No. 113 (Seventh in class. Chase shared driving duties with Don Chase and Ryan Plowman.) Co-Driver Don Chase said: Ryan (Plowman) got stuck for about two hours in the silt. Travis (Chase) had two flats in San Felipe but only one spare. That kind of slowed it down. He had one flat and then 20 miles later, before he got to our pit he had another. We had a sticking throttle, flat tires and stuck in the silt but I had no problems at all, but the young guys struggled day and night.